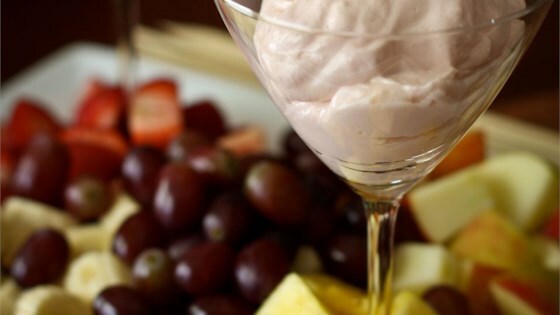 "This is a really light and fluffy fruit dip that is great at parties, holidays, or any time! Serve with fruit of your choice." I read all the reviews, and I don't know why, but mine was not very good! I even added the coconut extract! I won't make this again. Used strawberry cream cheese, added 1 cup of cool whip and 2 tbsp orange juice. Had people at the party eating dip without the fruit it was so good. Thanks for the great recipe. Very good. If you add cool whip make sure the cream cheese and marshmallow creme are mixed well first. Serve with a fruit and bite size cubes of pound cake! Yum! This is the BEST! Served at a baby shower with fresh strawberries and it was WONDERFUL. Definately going to be a mainstay in my party food!